Figure 2. The GLORIA sidescan-sonar vehicle (or fish) as it is prepared to be lowered into the water from the stern of a research ship. Remote-sensing technologies provide a unique view of otherwise inaccessible areas, as well as powerful analytical capabilities. Most imaging techniques that we are familiar with, such as photography or satellite imaging of the earth, use reflected light as their data source. Sonar technology uses sound waves to create images called sonographs or acoustic images. This technology is an essential tool in the study of the seafloor. The first sidescan-sonar system was developed in 1960 by the Institute of Oceanographic Sciences (IOS), now the National Oceanography Centre, Southampton (NOCS), in the United Kingdom, for use in shallow water. When the U.S. Navy submarine Thresher was lost in 1963, the need for deep-water search capability became clear. In 1969 IOS introduced GLORIA (Geological LOng Range Inclined ASDIC), the first sidescan-sonar system capable of deep-water geologic surveying. In 1977 IOS produced the next generation, GLORIA II, which was used to collect the imagery presented in this publication (Somers and others, 1978; Somers, 1996). The GLORIA II sidescan-sonar system (hereafter referred to as GLORIA), used by the USGS to map the EEZ, was specifically designed to map the large-scale morphology and texture of seafloor features in the deep ocean. To efficiently map an area as large as the EEZ, some detail had to be sacrificed. GLORIA cannot resolve human debris such as pieces of shipwrecks, but it can map an area the size of New Jersey, approximately 27,700 sq km, in a single day. The sidescan-sonar images archived in this publication are characterized by the best processed resolution, which is 50 m. Outside of the Alaskan EEZs, most of the images cover quadrangles bounded by 2-degrees of longitude by 2-degrees of latitude or smaller. Most of the Aleutian Arc, Bering Sea and Gulf of Alaska EEZ survey areas are presented as 3-degree by 2-degree quadrangles; other quadrangle boundaries were adjusted to include irregularly shaped areas. A composite mosaic of each of the 13 EEZ survey areas are also available at a 250-m pixel size. Acoustic images of the seafloor are formed by aiming sound waves at the seafloor and recording the returning sound waves. These images are graphic representations of the interaction of acoustic energy with the seafloor, not optical views of the seafloor. The GLORIA II sonar vehicle is 8 m long, weighs 2.25 tons in air, and is neutrally buoyant in sea water (fig. 2). This torpedo-shaped "fish" is towed behind at about 50 m depth by using a heavy cable containing electrical wires that transmit the signals between the ship and the fish (fig. 3). The electronic instruments in the fish send out a pulse of sound that travels through the water and is reflected by the seafloor sediments. Computers aboard the ship then record the amount of energy (backscatter) that returns from the seafloor and use that data to create an image. 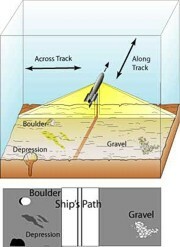 "Sidescan" refers to the shape of the sonar beam, which fans out to the sides and scans a wide "swath" of seafloor (fig. 4). The energy beam is confined to the plane perpendicular to the ship's track, forming a narrow acoustic beam in the horizontal plane and a broad beam in the vertical plane. With every sound pulse the fish emits (every 30 s), it images one strip of seafloor as much as 22 km wide on each side of the fish. As the ship tows the fish along its course, it scans successive areas of the seafloor, building a long swath of imagery pulse by pulse. The fish is towed along parallel tracklines back and forth over an area, like mowing a lawn, with a small amount of overlap between adjacent swaths (fig. 5). With proper navigational control, these parallel swaths of sonar imagery can be mosaicked together to produce large areas of continuous seafloor imagery, similar to the method used in aerial photography. Figure 5. This image shows a typical survey trackline taken during the acquisition of the GLORIA sidescan-sonar data. The mosaic is a gray-scale image of the acoustic backscatter variations of the seafloor. The darkness or lightness of a feature on the mosaic is a function of how much sound is backscattered from the seafloor. The intensity of the backscattered acoustic energy from the seafloor is a function of the gradient or slope of the seafloor, of the surface roughness, and of the sediment characteristics such as texture. On these images, white represents the most acoustic backscatter and black represents the least. Seafloor topography dramatically affects the amount of backscatter received by the sidescan fish. When viewed from the ship's trackline, a positive-relief feature, such as a volcano, usually appears as a bright zone (the slope facing the sonar beam) with a dark zone (the acoustic shadow) behind it. Conversely, a negative-relief feature, such as a canyon, usually appears as a dark zone (the near wall is shadowed) followed by a bright zone (the far wall is facing the sonar beam). Rock substrates such as seamounts, volcanoes, and oceanic ridges reflect considerable acoustic energy (high backscatter) and are recorded as bright areas on the sidescan image. Bright patterns also can be caused by certain sedimentation patterns and by steep sediment-covered slopes facing the sonar beam. Seafloor materials such as soft mud tend to absorb much of the acoustic signal, returning very little energy (low backscatter), and appear on the image as dark areas. Dark patterns also have a variety of causes, but commonly are caused by acoustic shadows and certain variations in sediment type.